Bring the look of beach inspired coastal decor into your home. It doesn’t matter where you live, adding coastal accents to your home will remind you of warm sunny days spent by the ocean. Enhance your home with sea-themed accents in calming whites or with splashes of color. This is the time of year when many of us long to be spending lazy days in the sun relaxing by the sea. While that may not be possible, there’s no reason that you can’t feel like you’re there! 😀 When trying to create a beach inspired coastal feel in your home, it can be tempting to fill it full of cutesy beach-themed accessories, but adding coastal decor to your home doesn’t mean filling your home with every little beachy tchotchke you can lay your hands on. In fact you don’t need to have a starfish, lighthouse or seashell in sight to create the calming, relaxing feeling of being at the beach. You’ll be much happier with the outcome if you do it in a more subtle way. 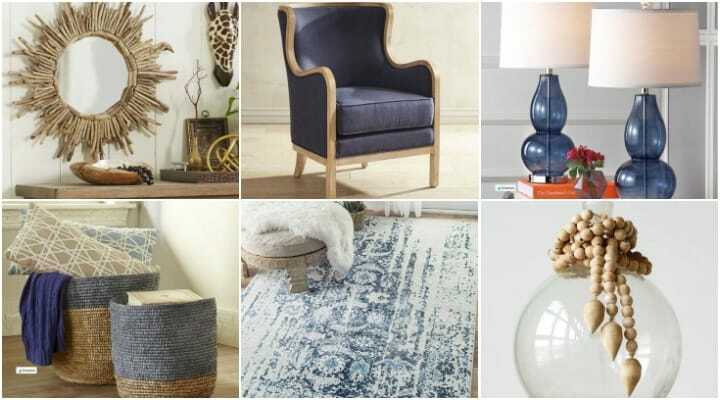 Add the feel of being ocean-side with the use of calming beach colors in shades of sand, blue and aqua and with the addition of texture in the form of natural fibers and wood accents. 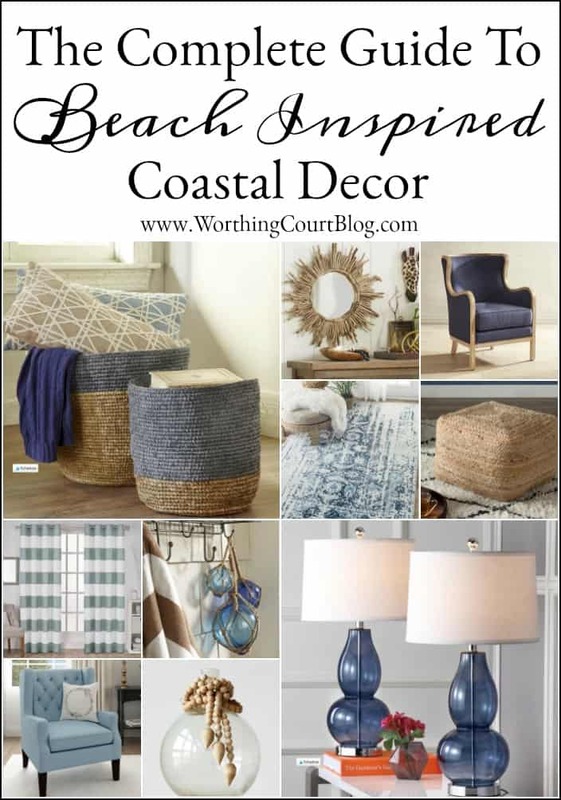 I spent hours yesterday browsing online to put together an amazing assortment of decor that you can use to get that easy, breezy coastal vibe in your own home. Have fun shopping! CLICK ON THE PRODUCT IMAGE TO LEARN MORE ABOUT IT. Affiliate links have been used, which allows me to make a small commission from your purchase. View my full disclosure HERE. I love blue and I love the coastal decor look. Thanks so much for sharing these great items! What a great reminder that we don’t need shells and starfish to make a room look beachy. I really liked the pillows and throws you suggested. Where can I purchase the basket trunk you are using as a coffee table in your beach condo? The first word came to my mind after seeing this is”Amazing”. I really loved this. Perfect picks for the feel of beach in the home. Thanks for sharing this I would also try this now. LOVE what you have done! We have a condo in Carolina Beach and love it too. It has taken me 8 years to bring it mostly up to speed…still need to do the master bathroom (very tiny!!!) and thinking that one day we won’t do summer rentals so we can just enjoy it whenever we want to! !